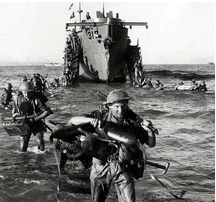 The waterlogged body was taken by Spanish authorities to a location where they opened the attache case and found an official-looking military envelope from Lt. General Archibald Nye, vice-chief of the Imperial General Staff to Gen. Harold Alexander, senior British officer on Gen. Eisenhower’s staff in Tunisia. The case with its unopened content was offered to the local British vice-consul, Francis Haselden who declined it, suggesting that the handover go through official channels. The Spanish Navy then turned over the documents to the Alto Estado Mayor of the Supreme General Staff. From there, the attache case disappeared and even the Gestapo in Spain could not locate it. Meanwhile, British authorities in London sent a series of increasingly frantic messages to Madrid asking the whereabouts of Major Martin’s briefcase. While Spain was a neutral country, much of its military were pro-German and the Nazis went to Colonel Jose Lopez Barron Cerruti, Spain’s most senior secret policeman and friend of the Germans, asking him to search for the briefcase.Barron had fought with the Blue Division, the Spanish volunteer unit sent to the Russian front to fight along Nazi troops. Once the briefcase was found, Barron and others opened the briefcase finding the military envelope. The envelope was maneuvered in such a way so it appeared unopened and reviewed the documents inside which revealed a secret Allied scheme to stage an invasion of Sardinia and Greece in the coming weeks. Arrangements were made to make all of the contents available to Nazi agents. Photographs were taken and immediately sent to Berlin. Believing Sicily was were an invasion would take place, General Alfred Jodl, head of the German supreme command operations staff proclaimed, “You can forget about Sicily. We now know it’s in Greece. ” Hitler and his High Command became convinced Greece was the target for an invasion and quickly ordered the transfer of Panzer tank divisions and other personnel to the Peloponnese in Greece. The dead man’s documents seemed to have been a major intelligence victory for the Nazis except for thing: they were fakes. The man they believed to be a high-level courier was really a 34-year-old mentally ill Welsh tramp by the name of Glyndwr Michael. He had died after eating rat poison. 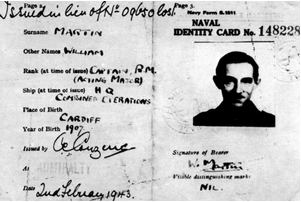 As part of a plan dubbed “Operation Mincemeat, ” British spymasters had dressed Michael’s body in the guise of a fictitious Royal Marine courier named William Martin. A briefcase stuffed with phony military plans, false identity cards, faked personal letters, receipts, bills, photographs and other “wallet litter” that gave the dead man a father, a fiance and a backstory. After the black attache case was attached to his wrists, the body was taken aboard a Royal Navy submarine, the MHS Seraph, and secretly slipped it into the ocean off Spain in the hope that in might deceive the Nazis. It was the perfect con. The Germans intercepted what they believed was crucial information about where the Allies would attack the Mediterranean, they were also convinced they had done so without tipping off the British. When a hundred and sixty thousand Allied troops invaded Sicily on July 10, 1943, it became clear to the Germans that they had fallen victim to one of the most remarkable – and successful – deceptions in modern military history. 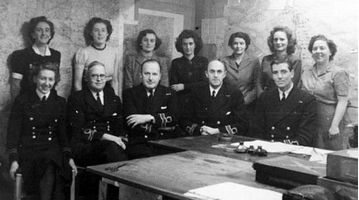 The men behind the audacious plan were two officers in Section 17M of the British Intelligence Service – a group so secret that barely 20 people even knew they existed. 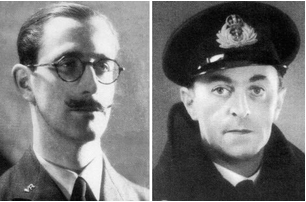 The two officers, who Churchill called “corkscrew minds,” were Charles Cholmondeley a RAF officer and Ewen Montagu, a Royal Navy intelligence officer. Oddly this highly successful and innovative twosome could not have been more different. Cholmondeley was a dreamer seeking adventure. Montagu was an aristocratic, detail-oriente But together they were the perfect team and created an ingenious plan: Get a corpse, equip it with secret (but false and misleading) papers concerning the invasion and drop it off the coast of Spain where German spies would, they hoped, take the bait. The idea was approved by British intelligence officials and Winston Churchill who believed it might ring true to the Axis and help bring victory to the Allies. Working with Cholmondeley and Montagu on this great deception was an extraordinary cast of characters including Ian Fleming, who would go on to write the James Bond stories; a famous forensic pathologist; a beautiful secret service secretary; a submarine captain; three novelists; an irascible admiral who loved fly-fishing; and a dead, Welsh tramp. Using fraud, imagination and seduction, Winston Churchill’s team of spies spun a web of deceit so elaborate and so convincing that they began to believe it themselves. From a windowless basement beneath Whitehall, the hoax travelled from London to Scotland to Spain to Germany and ended up on Hitler’s desk. 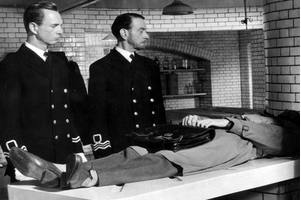 ‘Operation Mincemeat’ was immortalized in the 1956 film “The Man Who Never Was, ” released by Twentieth Century-Fox Film Corp. and starring Clifton Webb as Lt. Cmdr. Ewen Montagu. The screenplay of the film stayed as close to the truth as was convenient, with the remainder being fiction. For example, the Irish spy in the film is a complete fabrication. Ewen Montagu declared that he was happy with the fictitious incidents which, although they did not happen, might have happened. During filming, Montagu has a cameo role, that of a Royal Air Force Air Vice-Marshal who has doubts about the feasibility of the proposed plan. force in the light of new data. The body of this British major, was found floating in a Huelva’s beach, in April 1943. He was carrying documentation to deceive the Germans and officially lies buried in Huelva cemetery. But version officer has serious inconsistencies. In this book uncover herrings, designed to hide the intricacies of how they planned and executed the operation of deception. Other data confirm that the operation subtracting his body and transport it in a german submarine to the base of La Spezia (Italy) to make a second autopsy was entirely possible. 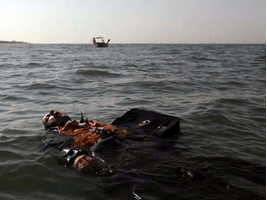 Respect his identity, the authors think that the body of one of the marines drowned in H.M.S. Dasher aircraft explosion in Scotland was used for it. It also described the events in Huelva, during Second World War.